Anyone ride around the Huntsville area? Looking for trails there and maybe get together with a group of riders. There are some good trails around Cullman, just south of you. There is also Stoney Lonesome up that way that is pretty good ricing. If you go a few hours north into TN there is a lot of good places to ride. There is a pretty good size group up that way. Not sure of the name, but you should be able to find it on the internet. 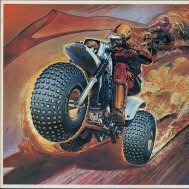 I found this web site that has places to ride broken down by state. The link is forthe Alabama page. Good web site !! The Colorado section is sweet !! They did not have any places listed in TN so I sent them a few. Coal mine is 30 minutes from downtown Huntsville, (bice mountain) it goes from new market to paint rock. I'll give directions if your interested, I have a key to the gates so PM me and we can find a time to go! Hi Y'all.. I'm new to the site. I added a few of our favorite riding spots. I'll keep adding more..
Just wanted to introduce myself. I would love to meet more Washington riders- and more female riders!. So stop by and say Hi! I just picked up a 2006 Kazuma Falcon 110 for my son. The previous owner ended up taking off the airbox and filter and replacing it with a cone style air filter and no airbox at all. 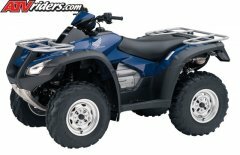 My son loved to ride through puddles, big ones, with his Polaris Predator (before it got stolen) and I'm wondering if I buy the OEM airbox/filter for the Falcon, will it protect the engine from the puddle splashes. Someone told me the standard airbox may have vents that won't protect it. Anyone have experience with the Falcon and riding in wet conditions? 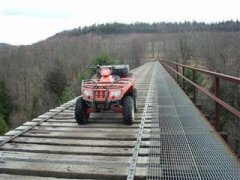 New to ATVing and by the end of the summer I'll probably be heading out into some remote mountain regions for some back country trail riding, and I'm wondering just what kind of stuff/tools etc I should bring along in case of breakdowns/events etc. Short list so far includes a GPS (probably a Garmin Montana 650T), a tire repair kit, and courtesy of my Mom one of those satellite personal locator beacons, probably the ResQLink+ from ACR. Any other suggestions for stuff that might come in handy? Me and my friends riding on litle tracks! !